In 2012 Tangshing Pong left his large family when he was just 14 years old to come to the Putao Orphanage to seek a better life. He lived in Wuning village near Kaunglanhpu (where Judah and Jonathon recently travelled) which is high in the mountains north of Putao near the border with China. He walked 10 days barefooted in order to come to the orphanage. He left his primitive and poor village that had no electricity, cars, or even bicycles. Pong excelled in school, and in sports, and was always full of joy and thankfulness. 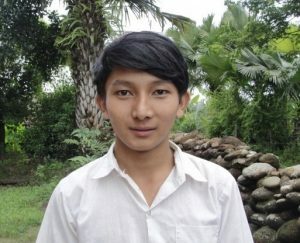 A couple of years after he came to the orphanage, he unexpectedly became paralyzed in both legs! He tried unsuccessfully to go to school using a walking stick, but was not able to walk at all and became bedridden. Despite all of this, he did not become discouraged. Instead, he prayed to God for healing. His doctors (who were believers) as well as his orphanage family, church family, and supporters also prayed fervently for his healing. The Lord answered our prayers and amazingly his leg problems vanished and he was completely healed! He was paralyzed for over 3 months. He had to work hard to catch up in his schooling, but he did so and had the desire to eventually attend Bible college and become an evangelist to the unreached people in the mountain areas. Today, Tangshing Pong is getting ready to finish is 2nd year of Bible college in Putao. His heart’s desire is to continue to serve the Lord and see his goal of becoming an evangelist fulfilled. We are so excited and proud of the godly young man that he is and we know that God will continue to use him in mighty ways.